Rowhouses were the basic building block of many East Coast cities, but (as I’ve mentioned before) the classic rowhouse never really caught on big in Chicago. Here on the open prairie, with the abundant timber of northern Wisconsin in easy reach, the wood balloon frame took off, and with it the detached single-family worker cottage. After World War II, however, the humble rowhouse got a makeover, and a second shot at success in Chicagoland. No longer the building block of the inner city, it became a more affordable alternative to those looking to make their home in the newly rising suburbs. The new rowhouse was clothed in mid-century Modernist garb and rechristened as the more market-friendly “townhome”. Construction of these units reached a fever pitch in the late 1950s. 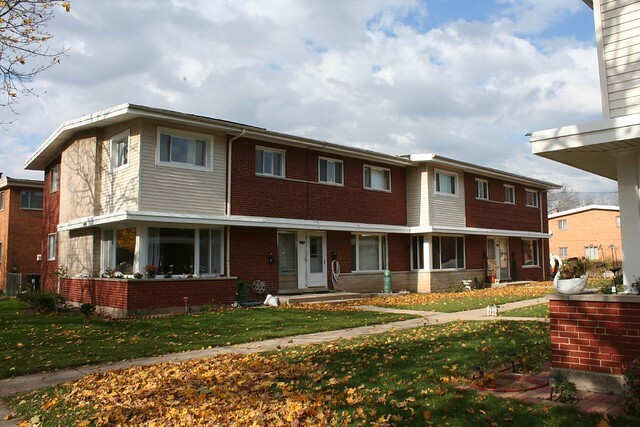 At its core, a townhome or row house is basically two or more houses that share vertical walls. Each unit has its own private, exclusive entrance – no shared stairwells. Each unit touches the ground. Beyond that, there were no rules in the post-war era. 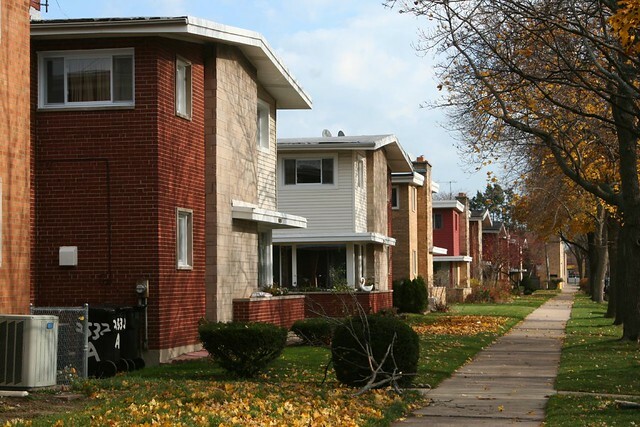 Pre-war rowhouses had commonly been two to four stories high; post-war could be two stories, split levels, or even a single story, with or without basement. No one would mistake a pre-war rowhouse for anything other than what it was – but post-war townhomes were often dressed up to look like larger apartment blocks, colonial mansions, or rambling split level ranch houses. 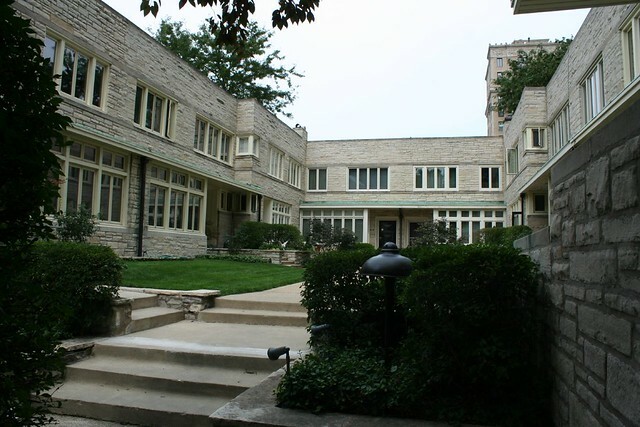 Rather than forming the basis of canyon-like streets, Modernist townhouses were very often set perpendicular to the street, with garden-like courtyards between them. 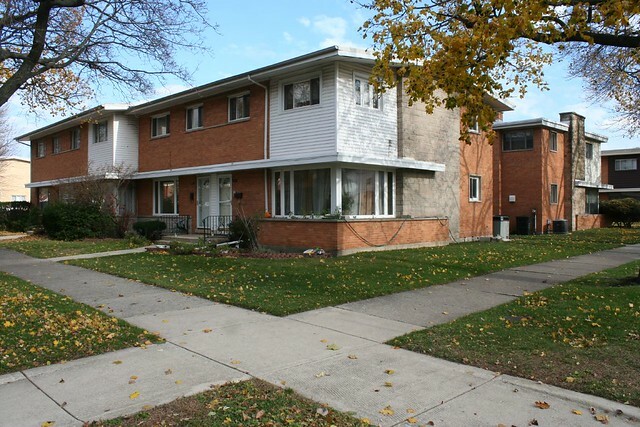 Flat roofs, brick and flagstone facades, and broad picture windows are common elements. …or go the other direction, and disguise multiple row homes as a single gigantic split-level ranch, as did Chesterfield Builders. When I first thought about the idea of a Mid-Century rowhouse, I thought they must be rare. But to the contrary, they’re quite common. Once you start recognizing them, they’re everywhere. I know of four different sets of them within two blocks of my home. 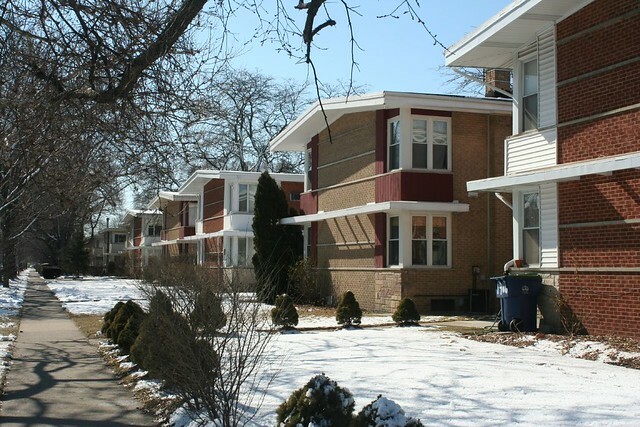 Like other forms of mid-century Chicago architecture, a sort of builder vernacular emerged, presumably as builders borrowed ideas, inspiration and perhaps architects from one another. 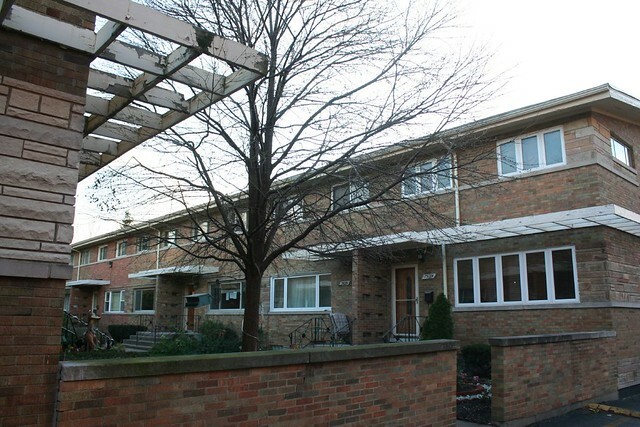 The typical 1950s Chicago townhouse can be described thus: two stories above ground with 4 or 5 units. Brick cladding except at the corners, where wood or cut stone forms an accent, along with a corner-wrapping picture window. The building mass is slightly offset at its midpoint, creating another chance for a corner picture window. 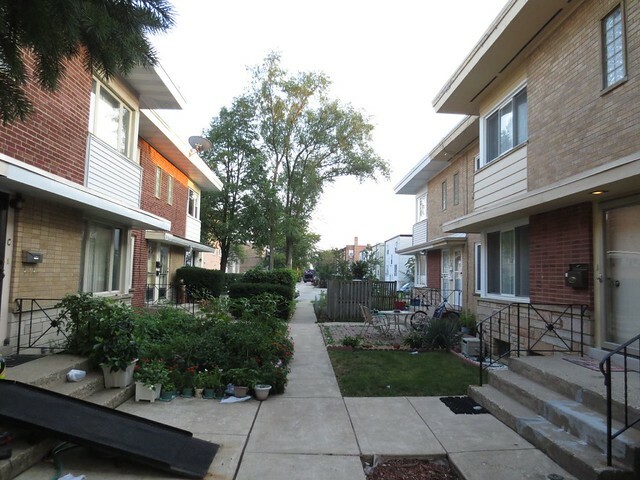 Buildings are paired off facing one another across a walkway and small yards, creating a shared courtyard. 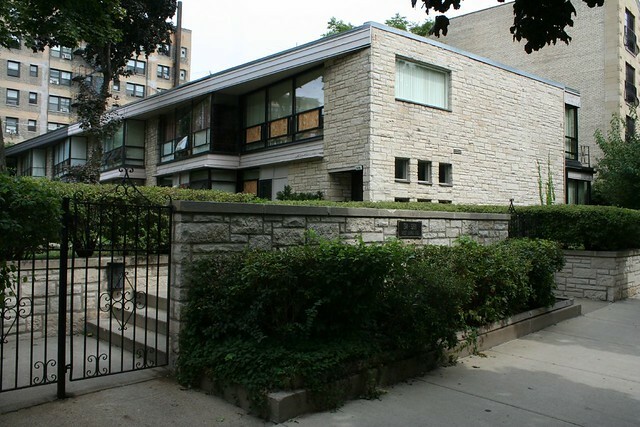 Skokie Townhouse Builders, Inc. – headed by Ronald Dreyfus and Robert Krilich, this company put up several developments with simple Modernist facades. * A cluster of 9 buildings at 9505 Gross Point Road in Skokie. 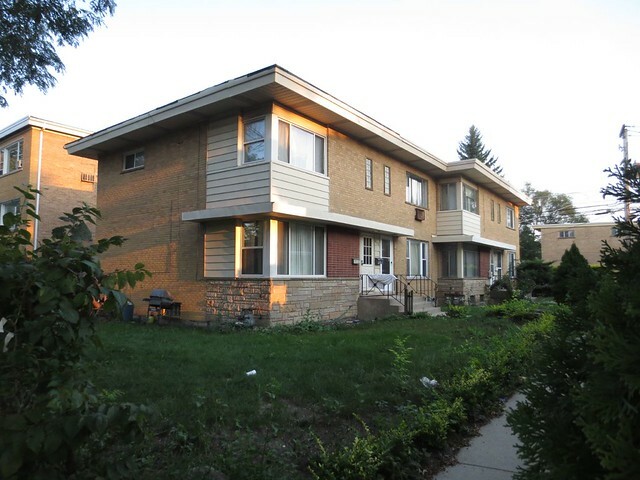 * 4702-4740 Main Street, Skokie – a group of eight on the north side of the street, perpendicular to the road, with a handful of additional buildings are on the south side of the street including one at Patrick & Main, 2 more at 4716 Main, and 3 more at 4712-4716 Washington. 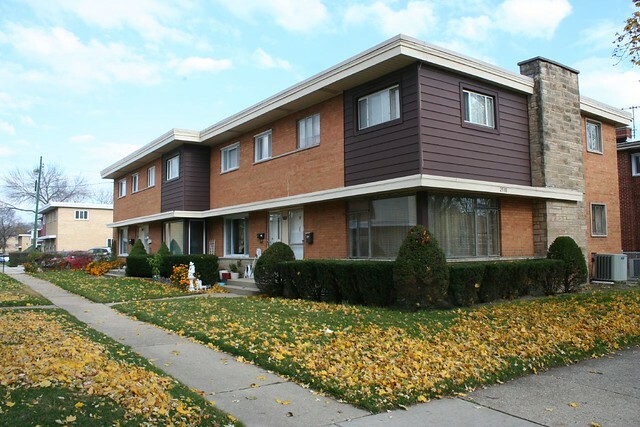 * 2505 Howard at Maplewood – a large group of Modernist townhomes, 35 total, along Birchwood, Jerome, Maplewood and Rockwell streets. Opened in 1960. 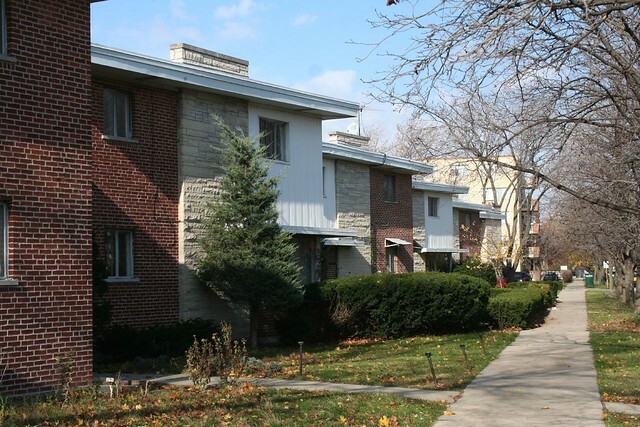 Of special note is the extreme similarity of Dunbar’s designs to those of Skokie Townhouse Builders. Both feature the same slight jog in the building footprint, with a first-floor overhang and brick walls giving way to wood paneling at the corners. To this mix, however, Dunbar Builders adds a massive chimney of gray Lannon stone on the narrow end of the building, as well as some additional details. 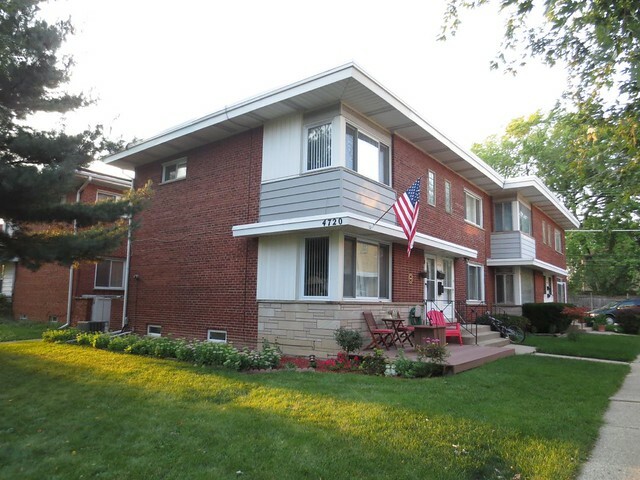 The Howard-Maplewood development uses a variety of elements and color – red, orange and beige brick; brown, red or white siding; ashlar or rough cut stone chimneys. The lines of the large corner picture windows at the living room are visually reinforced by built-in planters. First-floor overhangs run the length of the buildings’ fronts. This examples above and below both retain their original thin steel frame windows on the corner unit. * 6900 Ridge at Farwell & Morse – A group of 6 buildings with a pleasing staggered placement, thanks to Ridge’s angle relative to the street grid. Opened in 1960. 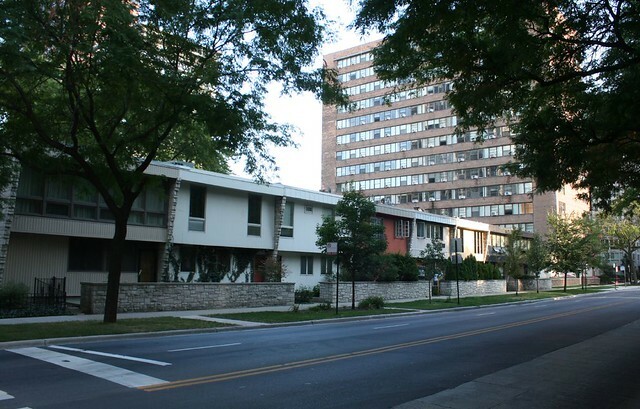 * 6100 Ridge – 9 Modernist buildings along Norwood Street and Hood Avenue, along with 5 more in a Colonial style across the street. Opened in 1960. They use the same Modernist design as the 6900 Ridge development. 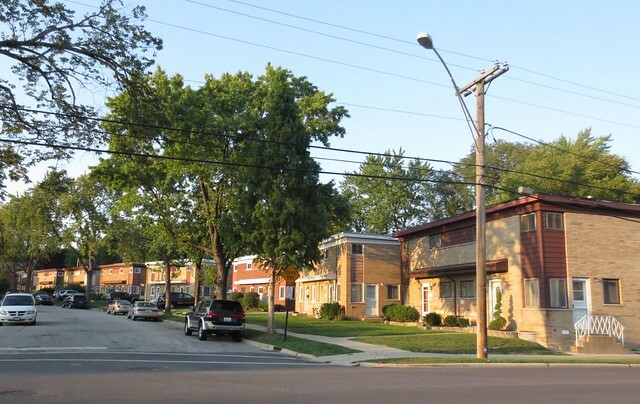 * Grand & Prospect at Dempster, Niles – a full-block cluster of twenty 5-unit buildings. 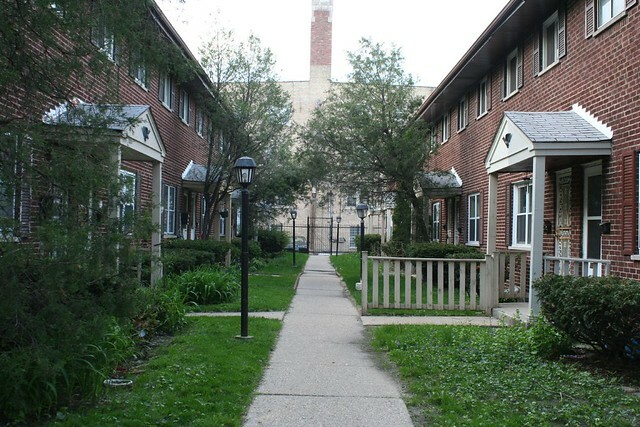 * Ridge Court Townhouses – 5 buildings at 7500-7508 N. Ridge, 1959. Variegated beige brick with flagstone at the corners, openwork wood frame faux overhangs at the first story, shallow pitched roofs, and vertical brick entry screens with small openings. This development replaced an abandoned farm house that had stood on the site for a hundred years. 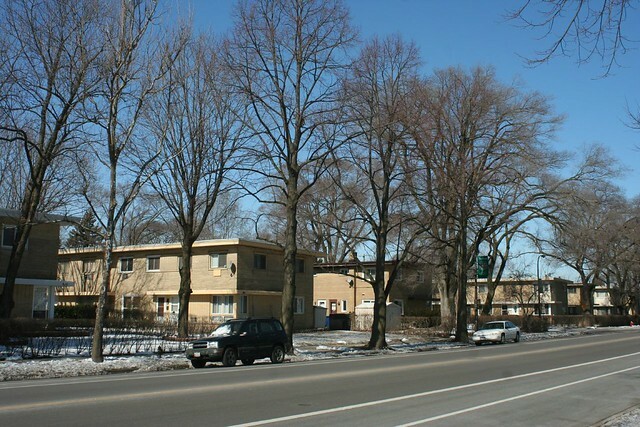 * 1000 Dodge Avenue, Evanston – twelve buildings perpendicular to the road. 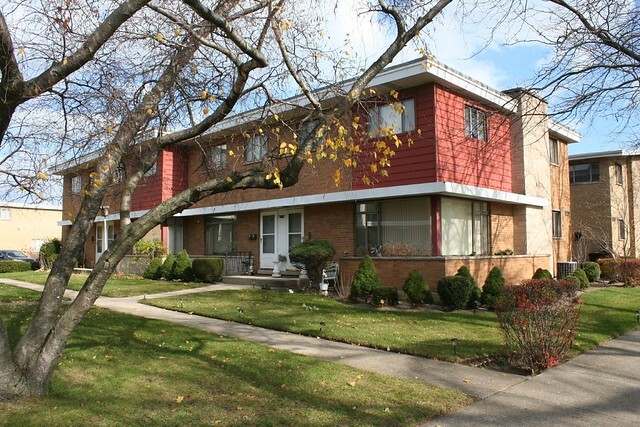 Opened by 1957, and built as rental housing. They could easily be by Dunbar Builders; the level of detailing is comparable. 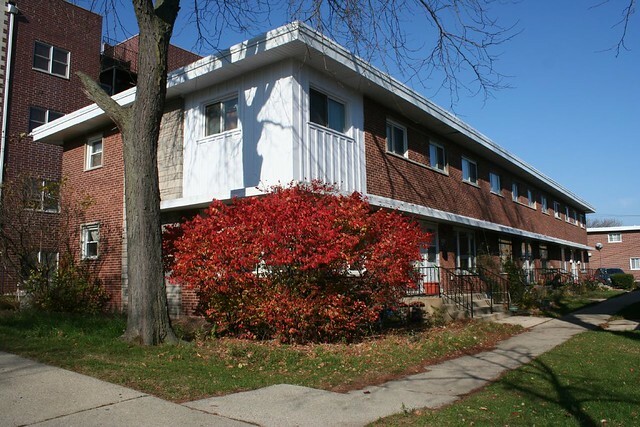 * 8401-8431 Lotus Avenue, Skokie – a group of twins – two units per building – lining one side of the street.